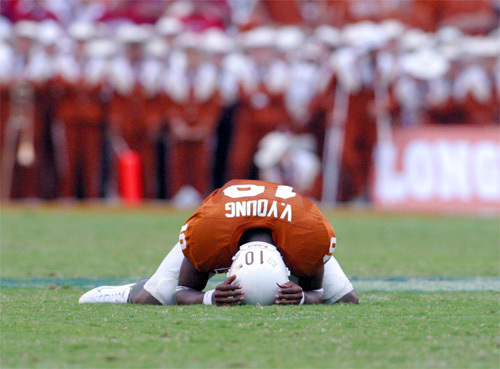 This picture of Vince Young (in his Texas Longhorn days) sums up my feeling right now. It’s time for a case of the NFL offseason blues. No games, no hits, no touchdowns, no pick six’s, no Vince Lombardi trophies being kissed, and no pigskins being thrust through the air like little brown missiles. So what is there to do between now and August for a devoted NFL lover? 1) Buy Action PC Football (www.dksports.com) and join one of the many leagues that offer contemporary play or retro seasons. I am about to re-enact the 1983 season as the Washington Redskins. 2) Get bitten by the podcast bug. There are a whole load of NFL related podcasts available from iTunes. They include ESPN Around the Horn, ESPN Pardon the Interruption, ESPN Football Today (which has just gone from daily to weekly), The Audible and NFL Rants and Raves. A few weeks ago I also discovered the Tony Kornheiser radio show, Tony is much funnier, less shouty and talks about more than just football (topics such as his dying dog and snow ! ).